I have three of the hydraulic pumps listed in the attachment. 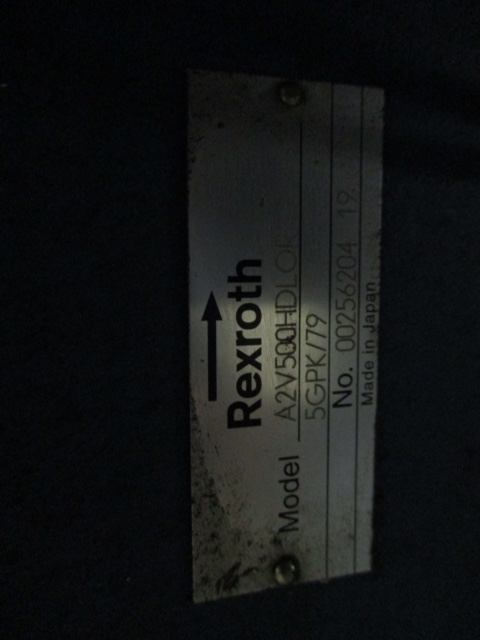 (Rexroth A2V500HDLOR 5GPK/79) The pump is made in Uchida Japan. I am having trouble getting the OEM numbers above translated into a bearing number that I can get fault frequencies for. In my motor circuit analysis Demod spectrum I am seeing non-synchronous peaks on two of the Motor/Pump units. I believe I am seeing two different fault frequencies and I am seeing a significant 5X peak. I am thinking that that the 5X peak is probably piston pass? The characteristic frequencies are not related to the motor bearings and the coupling has more than 5 elements. These pumps are about five or six years old. I have been told that there is a long lead time and a post I read said that they usually run until they fail, not really giving a lot of indication that they are going bad other than watching specific bearing frequency changes. Any information would be greatly appreciated. I will be using vibration analysis on this pump, as well. I am hoping it will show up in Peak Vue. If anyone has bearing numbers or any information on this pump, I would ap apreciate hearing from you. If you have any suggestions as to best practices for monitoring them, I would be glad to hear of those, as well.